Guitar tuning can be more frustrating then the early stages of learning to play itself sometimes. If you've found this page by chance and don't know where to start, begin by going to the fretboard orientation video on the Guitar Music Theory Day One page of this site. 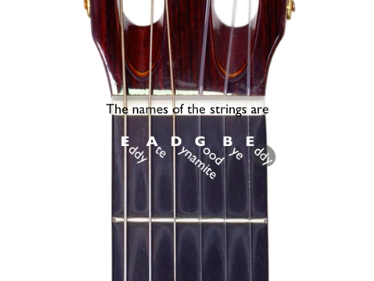 This will explain the names of the strings and the orientation of pitches and how they are normally tuned in "standard" guitar tuning. By far the simplest way of tuning to start out with, once you understand the arrangement of the strings, is by cheating! What I mean by that is to start with just buy a guitar tuner. I wouldn’t recommend a cheap one though. Whether you learn to tune “as easy as breathing” or not you will always need a good tuner. 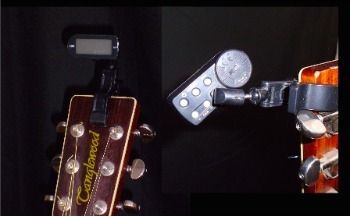 In my position the best option is always the modern “clip on” type of tuner that has a spring clamp affair that clips on to the headstock (link to orientation video) of your guitar. (see also headstock wikipedia). If you get one of these make sure that it has the piezo-electric type capability not just (dynamic or condenser) microphonic capability. Both functions would be best. The piezo setting allows you to tune any instrument regardless of ambient room noise, even an electric guitar that is not plugged in. It works by measuring the frequency of the structural vibration generated by the string (or air column or impact etc..) through the guitar (or other instrument) body. A microphone picks up air pressure difference so this setting allows you to clip the tuner on to any kind of stand and have a queue of students from flute players to tuba players to violinists and left handed flootsnooters to tune up as long as everyone else who is not tuning up shuts up! See Music Theory Ground Floor for more on this. There are two caveats here. Firstly a tuner is only a tool. You need to realise that owning a sharp expensive saw with teeth set, shaped and sharpened for a particular woodworking purpose does not make you a good carpenter! You need to understand how to operate the tuner well enough to make it effective. For example, you need to know how to read the display properly i.e. how does it handle sharps and flats, or enharmonic equivalence? is it instrument specific? Is it chromatic? More on this in a bit. You must be aware of the limitations that each individual model has in the ranges of pitch that it can “hear” and recognise. If your low E string is too loose, too slack, in other words at too slow a frequency of vibration, the device may not pick up a measurable enough signal to display an appropriate reading. Secondly, the idea is that you use the tuner as a learning aid for how to recognise what being in tune sounds like. You should use it as an ear training helper to develop your aural perception. It should not be used as a crutch that will inevitably, no matter how eventually weaken the skill of aural perception. But what if you don't have and don't want to buy a guitar tuner? What if I just want to know how to tune my guitar? !